We enjoyed this bottle of Burgundy with a Dutch dish called “Parelhorn met Dragon-Dille Boter” otherwise known as guinea fowl with tarragon and dill butter. The guinea fowl is flavorful and light…I like to think of it as slightly gamier chicken…this is how all chicken should taste. The wine is a premier cru Burgundy from the Cote d’Beaune in the Cote d’Or. With the price of well known Burgundy producers/regions in outer space Savigny and Santenay are great areas to explore on weeknights or with low key meals with solid bottles available around $20-$30. For something more sophisticated with a weekend meal or having guests but still on a budget I’d recommend jumping to something a bit nicer around $40-50. Jadot Gevrey-Chambertin, Chassange-Montrachet, Nuits-Saint-Georges, or Meursault are all good choices. colonelgrape: 84. We had this on a weekend with a big meal but I’d consider it more of a weekday drinker. On the nose there was red/black cherry, fresh earth, and a hint of citrus…young smelling. As the night went on the nose improved. Similar on the palate but I enjoyed the nose more than the taste. Even though most young Burgs tend to be a little tart at the end the finish here was on the tart side. Overall it was a somewhat simple but good value at $25…I’d drink it again. MobyGrape: 81. There’s just something about pinot that I’m not so keen on, and I just can’t quite put my finger on it. Oh wait, yes I can. It’s the incredible tartness that comes along with young pinot, or pinot that isn’t mad expensive. I want to like it so badly, because it works perfectly with lighter meats until you get to that puckery finish and then it’s just ruined. Ok, maybe that’s a little dramatic. It’s not ruined, this was a perfectly fine bottle of wine, I just didn’t enjoy it as much as I wanted to. 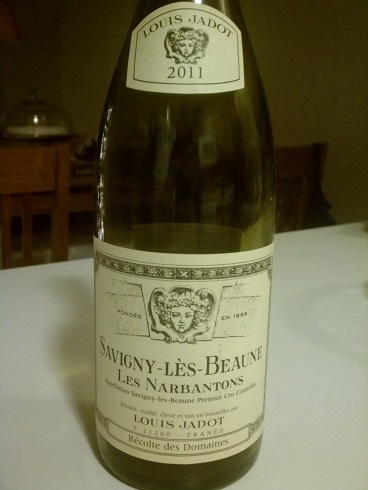 This entry was posted in Burgundy, Cote d'Or, Cote de Beaune, France, Pinot Noir on December 14, 2013 by colonelgrape. I enjoy Arbor Mist the most.